A UN committee has expressed “alarm” over reports that hundreds of children have been killed by US military forces in Afghanistan in the past five years. US forces in Afghanistan (USFOR-A), which leads the NATO fight against Taliban insurgents, dismissed the committee’s concerns as “categorically unfounded”. The Geneva-based Committee on the Rights of the Child (CRC) said the deaths were “due notably to reported lack of precautionary measures and indiscriminate use of force”. It gave no precise statistics. NATO forces had reduced civilian casualties by 49 percent in 2012 compared with 2011 and the number of children killed or wounded in air strikes had dropped by nearly 40 percent in the same period, said a statement from USFOR-A. A UN report in April last year said 110 children were killed and 68 wounded in air strikes conducted by US-led NATO and Afghan forces in 2011. The committee’s report also expressed concern that troops responsible for the killing of children had not always been held accountable and that family grievances had not been redressed. The US forces statement said that in each case in which civilians are killed, “military officials make every effort to meet with the families of those we have harmed and to express our condolences personally”. The CRC’s comments came after a five-yearly review of US compliance with an international treaty on the involvement of children in armed conflict. It said it was “alarmed at reports of the death of hundreds of children as a result of attacks and air strikes by the US military forces in Afghanistan over the reporting period”. “The US can and should do more to protect children affected by armed conflict,”said Jo Becker, children’s rights advocacy director at Human Rights Watch, a watchdog based in New York. She called on the US to heed the committee’s recommendations, which include taking “concrete and firm precautionary measures and prevent indiscriminate use of force” to ensure that no more civilians and children are killed. UN figures show that the vast majority of civilian casualties in the Afghan war are caused by Taliban insurgents, mainly through bombs and suicide attacks. 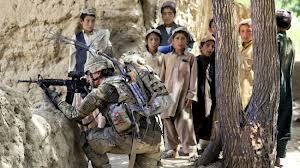 The US forces statement said insurgents killed or injured nearly 3,500 civilians in 2012, 84 percent of the total, while NATO forces were responsible for about eight percent. The cause of the other deaths was unknown. But those caused by NATO forces have long been a source of friction with the government of President Hamid Karzai.